DOG & CAT BOARDING KENNEL Abbott's Groom & Board. Convenient location Greensboro, NC. Whether your dog or cat is joining us for just some fun-filled hours or for a few restful overnight stays, you can rest assured that we are dedicated to providing the very best experience for your four-legged family member and that their care is always our number one priority. Come see what sets us apart from the rest! Wiley Lewis Road is Closed for Bridge Repair. 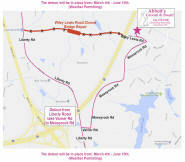 The detour will be in place from: March 4th - June 15th. Pet owners should discuss whether or not any product is a good option with their veterinarian.